The Katahdin & Moosehead Lake region of Maine features some riverside campgrounds, RV Parks and camp sites. 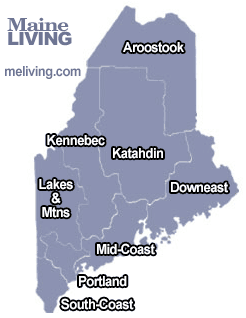 Bangor and Orono are the bigger towns in this massive region of western Maine. The Katahdin & Moosehead Lake region of Maine offers outstanding snowmobile trails in winter and ATV, hiking, fishing and white water rafting in summer. Ask us about Maine RV or Camping Vacations or share comments. To feature your Maine business, contact us.